When gazing at the river have you ever wondered how much water is flowing past you? The Club’s website gives the link to the Environment Agency and the water levels at Loud’s Mill and the weir on the Stinsford side stream but how do those relate to the amount of water flowing in the river? There are two weirs and the fish pass at Loud’s Mill. 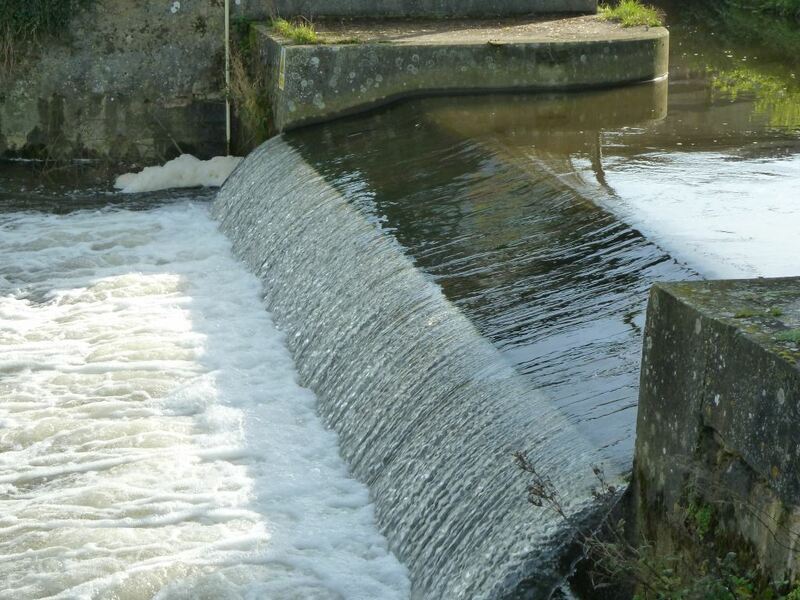 According to EA figures the main weir is 10.66 metres wide and the width of the mill stream weir is 1.52 metres. They are both Crump weirs, a type widely used throughout UK Rivers because they have a stable flow against head characteristic and their calibration does not change much with changing water flow. A text book equation for the flow over a Crump weir in cubic metres per second is: Q=2*W*H^1.5, where W is the width of the weir in metres and H is the upstream head in metres above level of the crest. Assuming that the water level measurement for Loud’s Mill is the same as the head over the weir, the flow can be estimated. Yesterday, when I took the photo, the level at the front of the weir was 0.16 metres, which in theory gives a flow of 1.364 cubic metres per second or 1.364 tonnes per second. According to the EA the typical range of river levels at Loud’s Mill is between 0.08 and 0.40 metres. This represents a range of flows over the main weir from 0.482 to 5.394 cubic metres per second. In the photo you can see the 1 in 5 gradient fall off at the back of the weir. What you cannot see is the 1 in 2 slope at the submerged front of the weir leading into the crest. It is these slopes that are characteristic of a Crump weir. By the way, yesterday the grayling fishing was good but instead of a fishing report I thought that some members might be interested to know how much water was coming down the river.